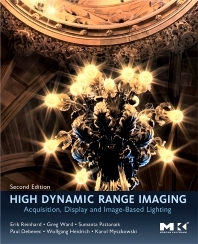 High Dynamic Range Imaging, Second Edition, is an essential resource for anyone working with images, whether it is for computer graphics, film, video, photography, or lighting design. It describes HDRI technology in its entirety and covers a wide-range of topics, from capture devices to tone reproduction and image-based lighting. The techniques described enable students to produce images that have a dynamic range much closer to that found in the real world, leading to an unparalleled visual experience. This revised edition includes new chapters on High Dynamic Range Video Encoding, High Dynamic Range Image Encoding, and High Dynamic Range Display Devices. All existing chapters have been updated to reflect the current state-of-the-art technology. As both an introduction to the field and an authoritative technical reference, this book is essential for anyone working with images, whether in computer graphics, film, video, photography, or lighting design. R&D Professionals in computer graphics, digital design and visualization. Visual effects artists in entertainment industry (including interactive entertainment/games). Engineering staff (i.e. coders, implementors of HDRI) at HDRI display/sensor manufacturers (e.g., Phillips, Samsung). Wolfgang Heidrich is Associate Professor and Dolby Research Chair at the Department of Computer Science, University of British Columbia. the Max-Planck-Institut für Informatik (Germany). Senior Researcher in the Computer Graphics Group of the Max-Planck-Institut für Informatik (Germany).